Great sport and everyday driving options. Very good looks that stand out without being over the top. Small back seat and trunk. Decidedly middle of the road fuel economy. Steering is mushy in all but the Vsport models. Cadillac has developed a signature look that is difficult to define but that most will immediately recognize. The 2016 CTS embodies that theme which is so hard to put a finger on. The distinctive, but now (thankfully) muted "boat prow" front clip, with the grille split in two at a sharp point upon which the Cadillac crest sits begins the design. Hood lines flow back from the fascia with sharply defined marks that aren't too heavy. Squared headlights with a long, fast flow point back across the fender and sharply-defined scoops below, mimicking the headlamp's shape, finish the front end. Sharp edges are everywhere on the Cadillac CTS, offset by rounded wheel wells and the curved roofline. Body lines are subtle, but straight, clearly defining the straight-line beltline, rear fender, and sharp cutoff with squared corners for the rear end. At the rear, straight lines and sharp corners continue to define the look, though the "big booty" appearance of last-decade's Cadillac is gone. 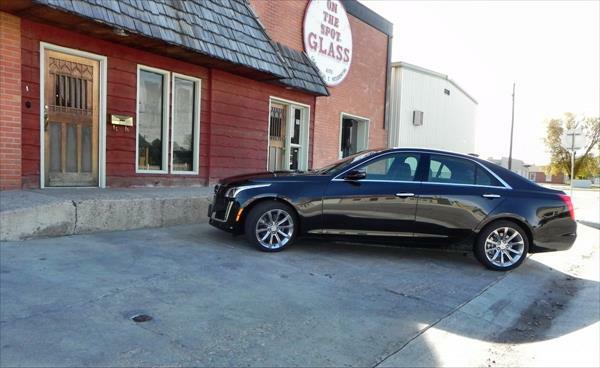 A square window, sharp third taillamp, and exhaust bezels similar to the scoops at front complete the sharp appeal of the Cadillac CTS. Compared to others on the market, the 2016 CTS is both very distinctive and luxuriously appealing to the target market. Pulling off that kind of look, combining both non-traditional styling cues and keeping it contemporary enough to attract buyers is a solid feat for which General Motors deserves a lot of credit with this Cadillac. Trim and package options for the 2016 Cadillac CTS change little in its appearance from the exterior, aside from various wheel options and an added rear spoiler in sport-tuned packages. The interior of the 2016 CTS is pure Cadillac with a sophisticated feel that verges on becoming ostentatious. Craftsmanship and high materials quality are hallmarks for recent generations of Cadillac, including this one, and the CTS is a showcase of how well GM's engineers can integrate technology with beautiful cabin design. The optional Carbon Fiber interior kit changes much of the wood trim inlay for carbon, darkening and changing the dynamic of the interior to a more sport-focused feel. 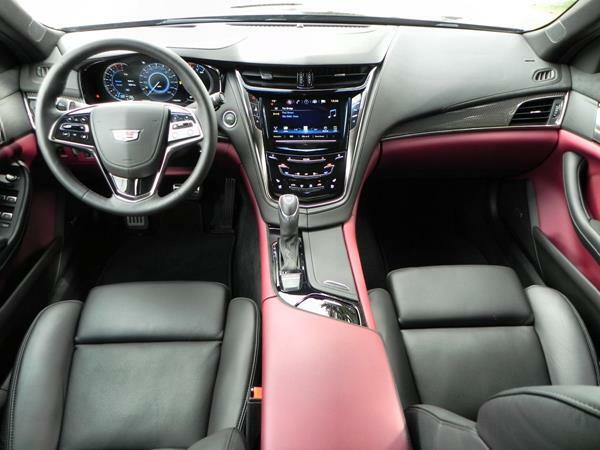 The wood options otherwise offer a lot of rich appeal for the already luxurious experience the CTS has. Seating in the front is excellent with plenty of room at all angles. The driver will easily find a comfort zone thanks to the base model CTS' adjustment options while the upgrades for the driver's seat add even more. Likewise, the front passenger will find a cozy, but roomy space with plenty of access to storage. In the back, though, the Cadillac CTS sacrifices some space to accommodate the front and the car's sport focus. 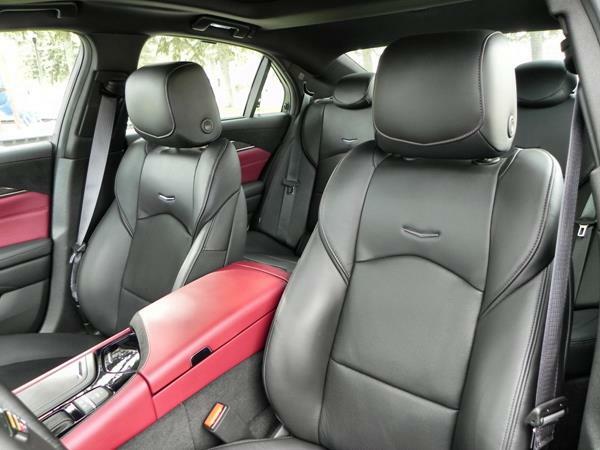 Despite being a midsize sedan, the rear seating in the CTS is a bit cramped compared to many domestic and Asian rivals, but is on par with most Europeans with a similar front seat focus. Cargo space is also limited at about 13.7 cubic feet in the trunk, smaller than most others on the market. The total experience of the Cadillac's interior, though, is beyond compare. 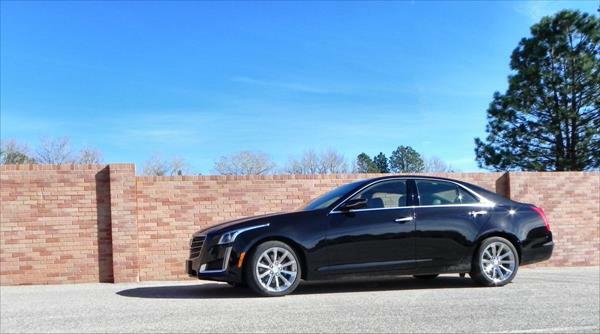 Outside of some much more expensive luxury options, we can think of no other midsize car with the kind of rich blend of opulence and comfort that the CTS has. The base model Cadillac CTS includes dual-zone climate control, automatic headlights, keyless ignition and entry, remote start, an auto-dimming rearview mirror, heated side mirrors, eight-way power front seats with driver-side memory settings, leatherette upholstery, and a trunk pass-through. Plus the technology listed below. Options for upgrade include a Seating package which upgrades the front seats for added adjustment, gives power adjustment to the steering wheel, and makes the driver's side mirror auto-dimming. Heat and ventilation are also added to the front seats and the rear seats become split-fold for added accessibility. 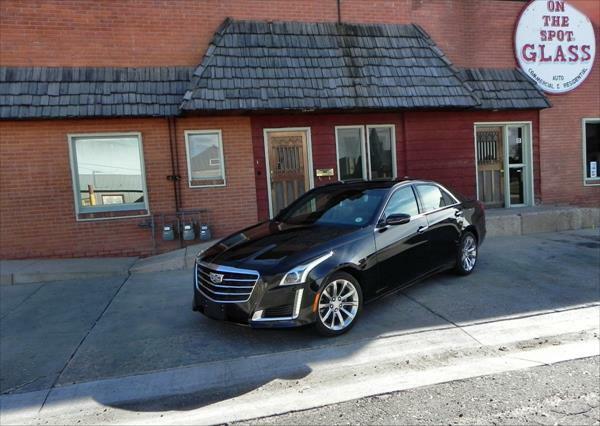 Things just get better from there as you travel through the five trim levels for the CTS. Automated lighting, wipers, driver awareness and safety options, and a heads-up display are all highlights of the upper trim levels. On the technology front, the base level 2016 Cadillac CTS comes well-armed and loaded for bear. Bluetooth connectivity and a new, faster, CUE infotainment system with 4G access (via OnStar) and WiFi come standard. Although we didn't get to try it in our test model, both Apple CarPlay and (towards the end of the year) Android Auto are included as well. The Cadillac User Experience is centered on an 8-inch touchscreen with a nice, high-quality display. Voice controls are also standard. The only substantial upgrade is navigation, which comes standard in most packages above the base level CTS. Other technology upgrades include a heads-up display for the driver on Vsport-tuned and Performance models. Surround-view cameras and self-parking options are also available, as are a myriad of safety inclusions (see below). The CUE system is relatively easy to learn, though it does have its quirks. Most of them will only be of concern to infotainment power users as the majority of everyday items and most-accessed options will be found easily via the menus or voice controls. Overall, fuel economy in the Cadillac CTS is good, but just middle of the road compared to most similarly-equipped rivals. The four-cylinder engine returns an EPA rating of just 25 mpg combined (21 mpg in the city, 31 mpg on the highway) in RWD and 24 mpg combined (21 city, 29 highway) in AWD. Most rivals with a four-cylinder option return better numbers than those and the non-turbo V6 for the CTS nearly matches the four's MPG returns. The base V6 offers 24 mpg combined (20 mpg city, 30 mpg highway) in RWD and 22 mpg combined (21 city, 29 highway) in AWD. Those numbers are achievable by daily drivers, with our week in the CTS with this base V6 in AWD averaging to 21 mpg in 225 miles of driving at high altitude. In the Vsport model, with its turbocharged V6, fuel economy is sacrificed for performance. The EPA gives this package a rating of 19 mpg combined, with 16 mpg in the city and 24 mpg on the highway. Although there are not yet any reliability ratings for the 2016 model year, the 2015 Cadillac CTS, the mechanics of which remain unchanged for 2016, received good marks. J.D. Power and Associates rated the 2015 CTS with a "Better Than Most" in its Vehicle Dependability Study last year. Only one recall was issued for the CTS last year as well. The model and now Cadillac in general enjoy a generally good reputation for reliability and dependability thanks to big improvements at the quality control in GM's manufacturing for the luxury brand. The 2016 Cadillac CTS received a full 5-Star crash test rating for overall performance in the National Highway Traffic Safety Administration (NHTSA) tests, the best score available. In Insurance Institute for Highway Safety (IIHS) crash testing, the CTS received best-possible "Good" marks in all crash tests performed so far and a top "Superior" rating for its optional advanced safety technologies. Standard safety equipment in the 2016 CTS includes everything expected of a luxury sedan on today's market. This includes GM's OnStar telematics and crash notification system. Optional equipment can include a surround-view camera system, active collision mitigation, adaptive cruise control, and park-assist systems to park the vehicle in parallel and perpendicular slots. The overall performance of the 2016 Cadillac CTS ranges from average to just ahead of the curve to blistering, depending on model choice. The base model CTS is powered by a 2.0-liter turbocharged four-cylinder engine that outputs 268 horsepower and 295 pound-feet of torque. An eight-speed automatic transmission is standard with this engine and includes steering wheel-mounted paddle shifters. Rear-wheel drive is standard, all-wheel drive is optional. Engine stop-start for city driving fuel savings is also included. The four-cylinder will not wow anyone with its speed or power, but it does offer the punchy appeal that only turbocharging can offer and is powerful enough to make the CTS feel sporty. The next engine option is a six-cylinder displacing 3.6 liters and outputting 335 hp and 275 lb-ft of torque. The same eight-speed automatic and stop-start are included here as well, as is the option of RWD or AWD. We drove this version with the AWD and found it thoroughly enjoyable as an everyday drive with just enough extra power to make it more fun in spirited driving on public roads. This is a well-balanced V6 with a good feel without any intimidation factor. In the top shelf performance option, the V packages for the CTS, the 3.6-liter V6 gets turbocharged to 420 horses and 430 lb-ft. The eight-speed automatic remains, but RWD is the only powertrain option. This muscular engine spins the turbos up to provide 0-60 times in the 5 second range, which is competitive with the Cadillac's contemporaries. Sounds from the engine are not V8-style muscular, but have a lot of speedy appeal. We drove this package briefly at a press event and enjoyed the well-tuned fun this option provides. On the road in most packages for the Cadillac CTS, handling and response is good, but not stellar. Steering is a bit dead, giving little return to the driver compared to rivals from German makes. 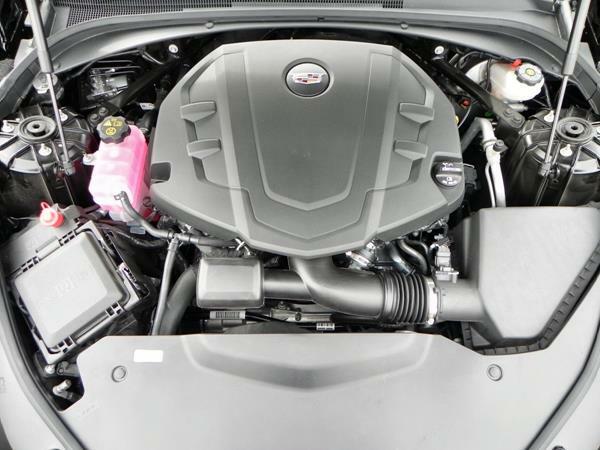 In the performance packages, including the Performance and Premium packages for the standard V6, though, that changes and the Caddy becomes much more dynamic for the driver. Much of that comes from the magnetic suspension dampers, which adjust to the driving conditions. 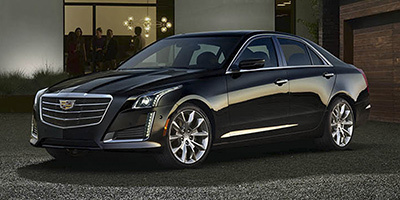 The 2016 Cadillac CTS is well-priced for the market and the level of luxury and excellent driving it offers. Like most luxury makes, however, Cadillac has generally low resale values beyond the third year. 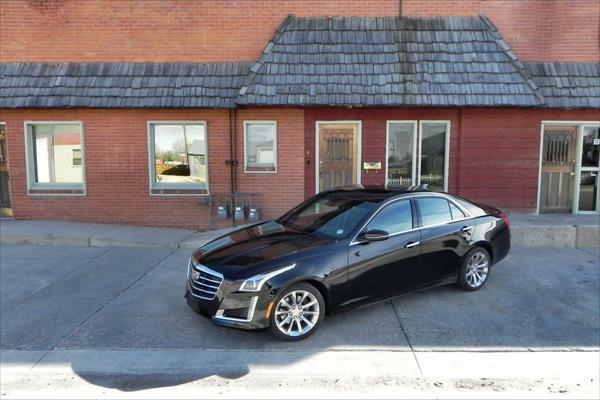 With a base price in the $45,000 range and a well-equipped mid-level price at under $55,000, though, the CTS is better than average for its return on investment in terms of style and luxury. Of note are the historically high resale that the sporting models of Cadillac's past have brought. The CTS-V is likely to keep with that trend, being one of the most sought-after models in the CTS group. So we make exception to our general rule of lower resale for that model option. We've scored the 2016 Cadillac CTS with an overall B+. On its own, the CTS is an A-level car, but rivals in the midsize luxury sedan market are thick and also well-adorned. The BMW 5-Series is more sedate than the CTS, but offers the luxury of a German make without the sport tuning. The Mercedes-Benz E-Class is very similar to the BMW in that regard, though a bit more stylish. The Audi A6 is very similar to the CTS in performance and handling, but lacks the interior sophistication. It's from Lexus that the Cadillac finds its chief rivals, with the GS 350 and its hybrid variant (GS 450h) having a lot to offer on every front to be compared. They also feature a larger back seat and bigger trunk, though sport handling is not as refined as in the Caddy. On the whole, the Cadillac CTS is a well-done, all-around luxury sport sedan with options to match nearly every buyer's desires. 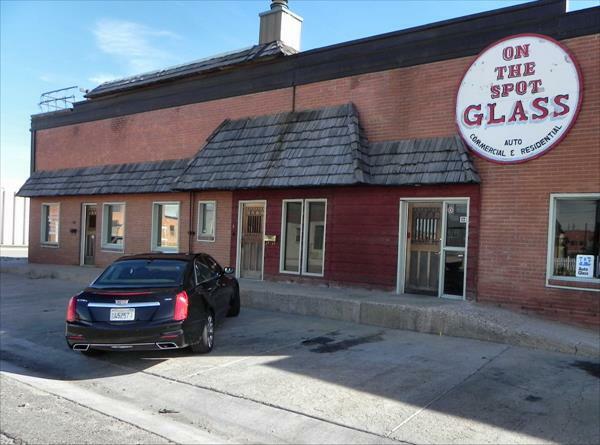 The base and mid-range models offer good performance and a very comfortable, well-accoutered interior while the Vsport models offer the power and performance many are looking for. Interested to see how the 2016 Cadillac CTS ranks against similar cars in terms of key attributes? Here are the 2016 Cadillac CTS rankings for MPG, horsepower, torque, leg room, head room, shoulder room, hip room and so forth.